A responsive, one page WordPress theme, with ample flexibility for individual blog posts. 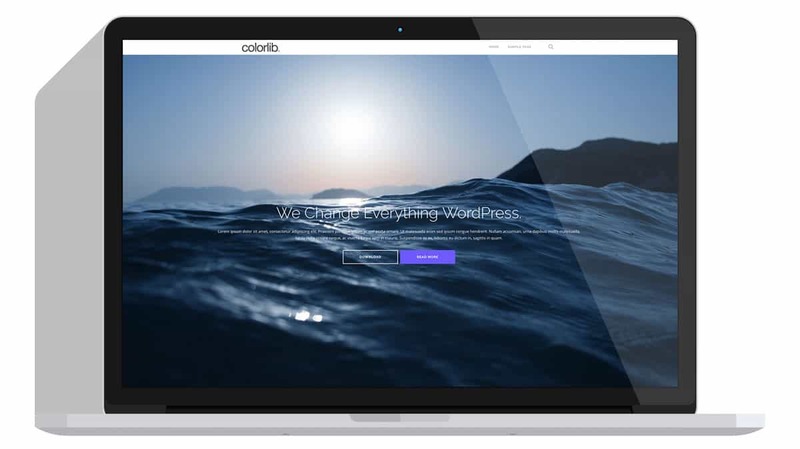 Let’s take a look at the popular, free WordPress theme, Shapely, built by the folks at Colorlib. We’ll highlight the main features of the theme, discuss what types of websites it will work best for, and talk about possible downsides. This review was paid for by the theme author, but it remains 100% objective. While Shapely will also support a full-featured blog, it was really designed as a one page WordPress theme for businesses. It comes with several widgets that are specifically designed to add sections to your homepage, and allow a visitor to scroll from section to section. I’ll talk more about how to add each of these sections in a minute. The first thing you’ll notice upon activating Shapely is a message that directs you to their setup page. While the message is rather large, and it does persist until you forcibly close it, their setup page does provide very helpful info for beginners. Their getting started page walks you through a recommended setup process, which includes installing a few plugins, reading their documentation, and a link to the Customizer to begin customizing the theme. NOTE: Shapely did some extra optimization to account for popular plugins like Contact Form 7 and Jetpack, so if you have them installed, they’ll work seamlessly with this theme. You can choose to either display a text-based site title, or your company’s logo. The logo can be easily uploaded via the Customizer. Shapely’s main navigation supports dropdown menus. The navigation also works really well on mobile devices. In terms of design, the font is a little small and the letter spacing a little tight for my liking, but that is largely personal preference. The logo & navigation remain stuck to the top of the page (aka: sticky header). However, there is no way to turn this on of off. Having that option would be a nice feature to add. A search icon is present at the far-right of the main navigation. Hovering over it opens up a search box. While this could be useful for sites with many blog posts, smaller businesses might not need or want a search feature. Unfortunately, there is no way to easily disable this (without editing code). This is where you’ll likely spend most of your time. Because Shapely is designed as a one page WordPress theme, the homepage is where most of your site’s content will live (with the exception of any blog posts you publish). It is worth noting that Shapely provides an option to import demo content. Doing so will set your theme up exactly as the demo on their website. Many users will find this feature helpful, however, for this review, I did not use the importer. Shapely comes packaged with a bunch of additional WordPress widgets to help you out. I’m going to highlight the specific widgets that come with Shapely, but you can actually add ANY WordPress widget to your homepage. One downside I saw here is that if you only choose 2 features, they are not centered. You’re left with extra space on the right. But if you have 3 features, they’ll all be displayed beautifully. Also, you can add links/buttons to the feature description, but you will need to know a little HTML. You can add a list of your clients, and have their logos displayed in an automatic slider. The logos are initially displayed with a lower opacity, and then brought to 100% opacity on hover. One downside is that the logos slide even if there are fewer than 4. I tried it with 2 logos, and the logos just moved from the left side of the screen to the right. If you’d like to add testimonials and/or a portfolio of your featured projects, install Jetpack, and use their custom content feature. Like I mentioned before, you can add ANY widget to your homepage. Just keep in mind, you might have to do some custom styling if it’s not one of the official widgets supported by Shapely. Body Text – Personally, I think the light grey body text is too hard to read. I would make the default color darker, but also give the user an option to change it. Footer Colors – If you use the footer callout section, there are essentially 2 footer areas, neither of which you can control background or text colors. Page Title Background – You can change the color of the page title text, but not the background. Header – It’d be nice to be able to chance the background & text color in the header, as well. I’m all for keeping theme options to a minimum, but I think these are very reasonable options to add for a little more customization. The main blog page also supports a custom page title at the top, as well as an optional background image that stretches the length of the screen. This is a really nice touch that is missing in many other themes. If you run a multi-author blog, you’ll be happy to know that Shapely adds an author bio box to the end of each post. It includes the author’s image, a short bio and some social media links. You can turn this off if you don’t want it displayed. The same options apply to static pages, as well. You have a long list of options when it comes to individual blog posts. You can see all of them listed below. This provides a great deal of flexibility when it comes to your post’s layout. I really love the flexibility here! Shapely supports indented comments, up to 5 levels deep. However, the design of each comment is not as polished as I’d like it to be. As you can see below, the date is very small and the Reply button text is not aligned well. Shapely does something that most other themes don’t—include a “related posts” section at the bottom of each post. You have the option to turn this on/off. It doesn’t come with any options for how they are displayed (and I don’t know what kind of algorithm is being used to determine what is related), but if you just want something simple, it will do the trick. For more advanced related posts options, you’ll want to turn to a plugin instead. Let’s take a look at the Shapely footer. As previously mentioned, you can add a call-to-action area just above the main footer. In the main footer, you can add up to 4 widgets to show off various pieces of contents. The footer widgets will be displayed in 4 columns, and they stack nicely on smaller screens. The one improvement I would suggest here is if you only add 2 or 3 widgets, adjust the width of those widgets accordingly, so that they take up 100% of the footer. Instead, every width is 25% wide, which, if only 1 or 2 widgets are added, leaves a large blank space on the right side of the screen. Shapely adds support for an additional menu, besides the main navigation. Just create another menu with all of your social media channels, assign it to the “Social” menu location, and you’ll have nice icons displayed in your footer that link out to your social channels. And there’s a nice little “back to top” arrow in the footer as well, if that’s your thing. It smooth scrolls you back to the top of the page. They’ve included an option to add your own copyright text in the footer, which is nice. However, you cannot easily remove the “Theme by Colorlib. Powered by WordPress” links (without editing some code). I really wish they provided an easy way to remove this. The Shapely one page WordPress theme is packed with options, both for your homepage, as well as individual blog pages. There are a few areas where it could clean up its design, but for a free theme, you’re getting a lot of nice features. For PHP, I recommend using the Code Snippets plugin. This is an alternative to adding PHP code directly to your theme’s functions.php file. So if you switch themes, your custom PHP snippets will still be there. So especially for PHP code that is NOT related to your theme, this is a great way to go. As for custom SQL code, I would refer you to the wpdb PHP class built into WordPress. Anything related to the database should usually be taken care of via this class. Keep in mind, this is rather advanced code, and I only recommend making custom database calls if you know what you’re doing. It is possible to bring down your entire site, or even worse, erase data. So please be careful with this one. How Can I create a carousel on my first page ? You’ll need to use a page builder or slider plugin in order to do that. Check out Elementor or Beaver Builder. They’ll let you fully customize your first page with sliders and other design elements. Is there any solution by adding code in CSS ? You can do a search for “css only slider” and try to implement it yourself. But using a page builder like mentioned above will give you a lot more flexibility, and save you some time. I hate the blog post page layout. I tried to use a plugin Blog Designer – Post and Widget to change it but it will not work properly. I hate the way my post look on my blog page. How do I fix this without having to change themes again? can we use elementor on this theme? You sure can! Elementor should work well with Shapely. We are using Shapely-theme. Is there any option or other possibility to translate blog posts Read More -button? Hi Susanna — I’m not sure. It’d be best to ask Colorlib, the developers who made it. I did not try any translations when I did this review. It’s possible that they just missed that button when adding in the ability to translate things. I’d reach out to their support. is there a way to add an “About” page? Hi Cat. Yes, there is. Just go to Pages > Add New, create an about page, and then in Appearance > Menus, add the page to a navigation menu so you can easily get to it.